Travis Monthly Workday, Saturday February 18 2017, 9 am – noon. Thursday the 2nd of February was World Wetland Day; this is an international date which marks the adoption of the Convention of Wetlands on 2nd February 1971 in the Iranian city of Ramsar. Each year is a different theme and message on a relevant subject set by the Ramsar Secretariat. The theme this year was Wetlands for Disaster Risk Reduction; this theme is very relevant to Christchurch in our post-quake environment and the risks faced from sea level rising. Travis Wetland has shown that it can act as a buffer by absorbing and storing excess rainfall. Thankfully the wetland area hadn’t been developed so was able to absorb the impacts of the 2010 and 2011 earthquakes. 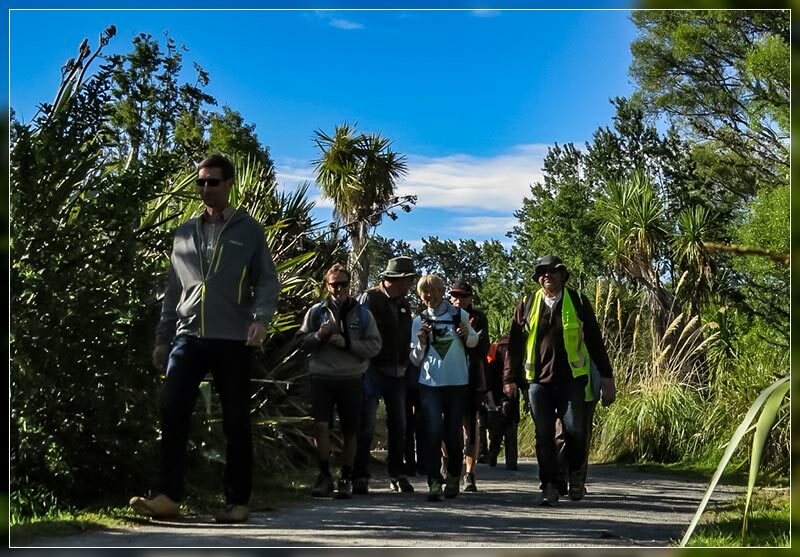 This year to mark World Wetland Day the Travis Wetland Trust and Avon-Otakaro Network lead a walk through the wetland. 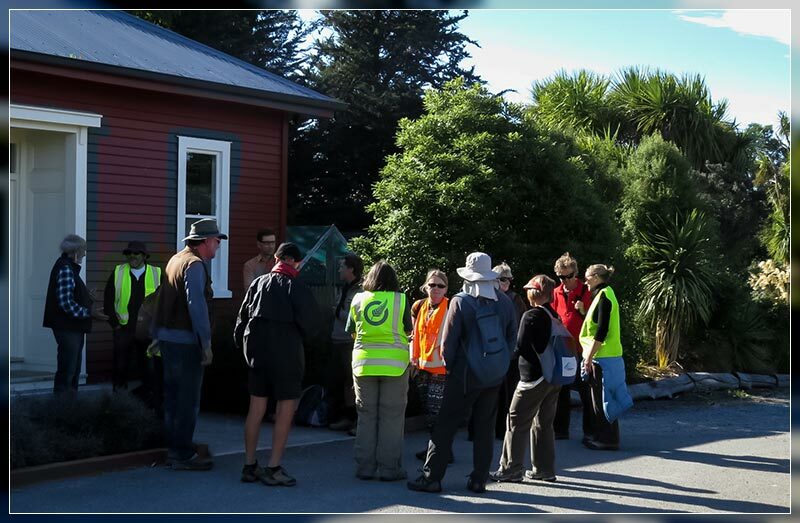 The walk started with an Mihi by Teoti Jardine followed by an introduction from the Travis Wetland Trust President, Colin Meurk. We stopped and admired the Millennium Forest (planting started here in 2000). Totara are now flowering so we hope to see some natural regeneration happening soon as we have with kahikatea. Walkers were informed about the Matai/Totara Forest by Sue and John Skilton the CCC Park Ranger; this area of forest in the south east corner of the wetland will in time be the size of Riccarton Bush. The group headed out of the wetland to cross into the red zone land on the other side of Travis Road. Here Evan Smith from Avon-Otakaro Network talked about their vision for the red zone; a multi-purpose forest/wetland park. He also discussed the Regenerate plan and the importance of having your voice heard in the process. Colin Meurk discussed his Eco-Sanctuary proposal which includes Travis Wetland and an area of red zone land adjacent. We then walked to the Mahinga Kai planting along Anzac Drive. Teoti Jardine talked about how the area with its wetlands was an important food gathering area for Maori. Native planting has been done here by various volunteer groups over a number of years. The forest will help to bring back biodiversity to the area and protect the waterway. The walkers then headed back to Travis Wetland via Anzac Drive and Frosts Road. We stopped to admire the Black Shags roosting in old willows beside the roundabout. Approximately 20 people enjoyed a lovely summers evening and an informative walk. Ably assisted by Craig’s I. H. C. team, Shona, Wayne, Al & Eleanor have been maintaining plants around the Ed Centre; then further! The Ed Centre was re piled as a result of the 2011 quakes. The original piles of stone, probably quarried from one of Christchurch’s many early days quarries, or possibly they were used as ballast from a pioneer sailing ship have been muscled into an ideal habitat for lizards by Ranger Kenny. Walkers will notice them placed close to the track on the west side of the Centre. 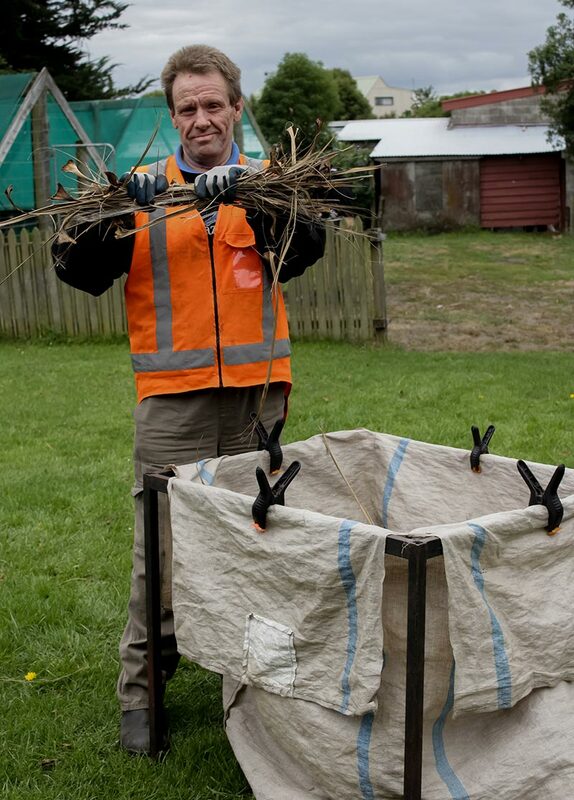 Favourite lizard food plants from Trees for Canterbury, Muehlenbeckia astonii, Melycytus alpinus and Korokia cotoneaster have been planted to provide food not only for the lizards but also insects and birds. A great set up — watch out insects for hungry lizards, watch out lizards for hungry birds! Watch out birds for the Harriers! Sophora prostrata along with a variety of other support plants will provide cover & shelter, ideal habitat. Of course it doesn’t end there as watering & weeding need to be constant. Each work afternoon the volunteers can be seen attending to this newly planted area along with the rest of the immediate surrounding’s plantings. Shade houses provide some of the plants for various wetland areas. Constant attention to the plants in the pots, [the weeds seem to grow very rapidly] is needed; this time is quite social but along with chat is serious weeding. 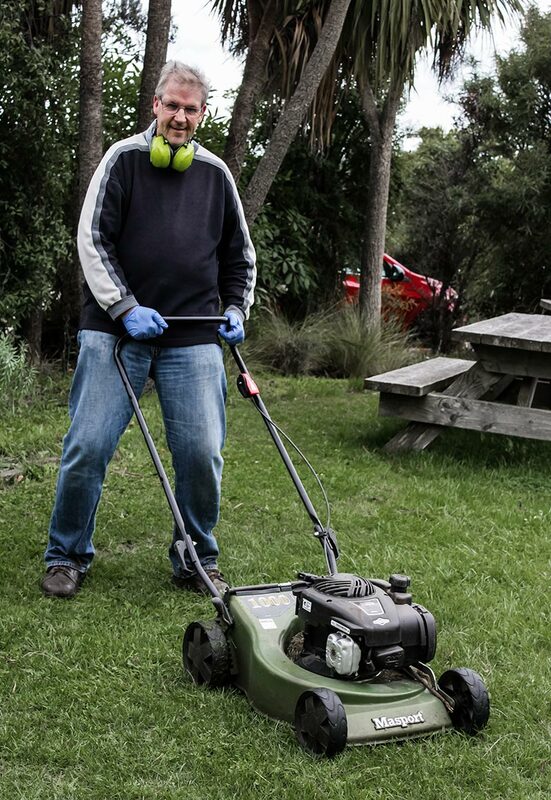 Craig’s experienced team love to help. Ranger John provided climbing plants namely native jasmines and clematis to add to the Millennium Forest. They are also tended and watered by the group to assist with their establishment. Watch out convolvulus too! Many plants around the Centre lay wilting in heaps. Coffee/tea and a biscuit are supposed to round off the work session but that isn’t always so. Two souls whose names begin with S. & W. are often spotted quote ‘just finishing off” a job! Maybe the chocolate should be taken out of the biscuits! Thanks to all involved — a most enjoyable & productive session. Faithfully watered by Joe, Wayne & Eleanor the dune plants along Mairehau Road are faring better than they did last summer. Ranger Kenny set up a watering system & made wooden stands for the sprinklers so that a large area can be covered at one time. Watering is very time consuming but walkers are glad to see it being done & comments are very favourable. Care is taken to make sure water is not wasted; it is most necessary on the light sandy dune soil during the long hot summer months. 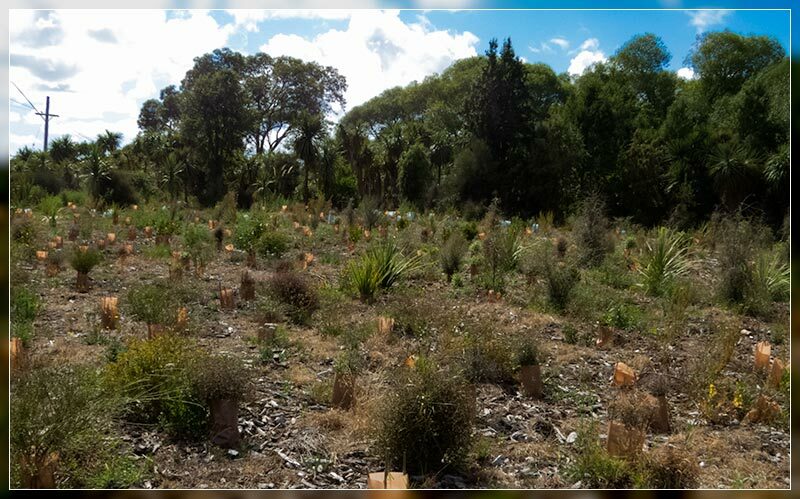 Saturday volunteers & Waitakiri school children who planted the area can see the living results from their efforts too. Ranger John & summer assistant Tom have worked tirelessly removing rampant weeds and channeling around the plants so the water is being taken up by the wanted plants. Thanks to our Rangers & volunteers who have made another huge effort on behalf of nature. 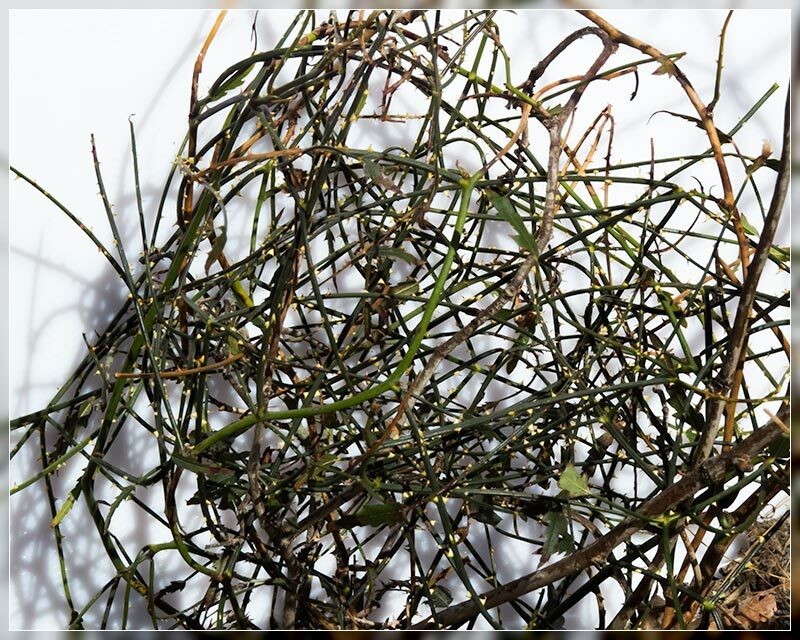 This endemic plant is a member of the rose family and is a slender, scrambling vine. 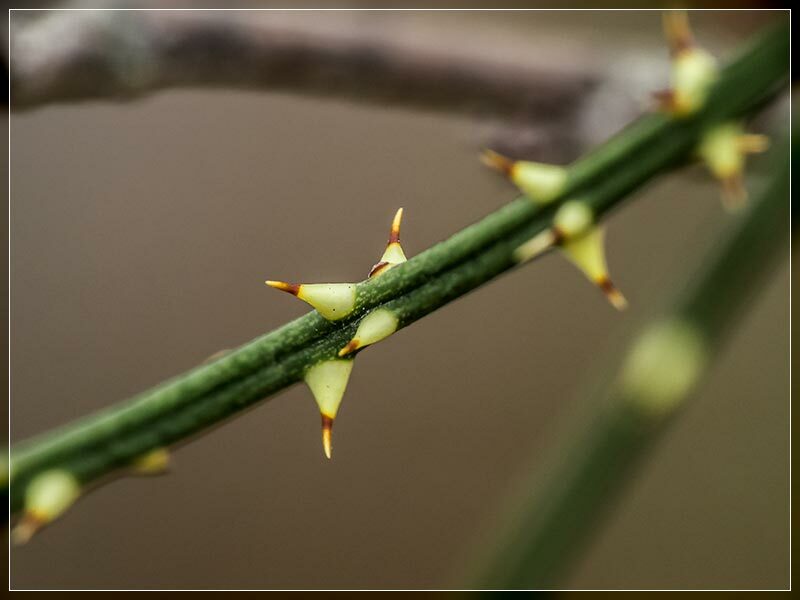 It grows as a tangled mass and, using sturdy yellow prickles on its stems, it can easily grow over other plants. Its leaves are slender and often not seen at all, though they do become more pronounced when the plant reaches canopy height. Small white flowers appear between October and December followed by orange-red fruit in February and March. The Leafless Lawyer occurs in both north and south islands, preferring eastern areas. Favoured habitats include riverbeds, dunes and shrublands. The plant is not considered threatened, though it is uncommon in large parts of its potential range. This may not sound like first choice for a wetland plant ! However, last year we planted a small number amongst existing shrubs on the dune areas near Burwood Hospital . This is a dry area and we hope the plants will do well there. Perhaps the dense tangle of stems will shelter invertebrates and skinks from predators, while flowers and fruits may attract insects and birds.